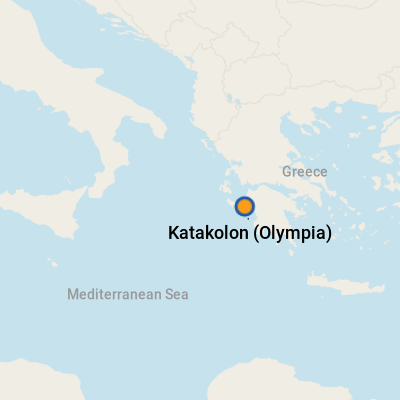 The seaside Greek town of Katakolon, with a population around 600, is your typical small-town cruise port -- fishing boats bob in the harbor; cafes lace the waterfront; shops sell T-shirts, hats and jewelry; and a small beach draws swimmers and splashers. But that's not why ships make this town a destination. They arrive because Katakolon serves as the cruise gateway to Ancient Olympia, the birthplace of the Olympic Games. Drive 40 minutes from Katakolon and you are transported back thousands of years. Stroll the UNESCO World Heritage Site of Ancient Olympia, and you walk in the footsteps of early Greek and Roman athletes -- wrestlers, chariot drivers, discus throwers, runners and long-jumpers -- who vied for glory and the gods' favor. Stand alongside the massive columns, and, with the tales of a good guide, you can envision the once-magnificent temples, athletes training in the palestra and runners readying on the track. Alexander the Great, Nero, Plato and Aristotle are among those who watched the games from where you stand. Tourists flock to the site and its companion museums, including the Archaeological Museum of Olympia, a treasure trove of pieced-together sculptures and statues that once adorned the ancient structures, and the Museum of the History of the Ancient Olympic Games, where you can learn about the original competitions. If you've already visited Ancient Olympia, there are other sights in the area, including the spectacular temple of Apollo Epicurius and the medieval Chlemoutsi (Hlemoutsi) fortress -- or seek out the golden-sand beaches that ring the Gulf of Kyparissia. Note: We recommend that you use Google Maps to locate the destinations in this guide by entering the name of an attraction or business, rather than the address, which often stumps Google Maps. You should also confirm the hours, which are changeable, based on the season and day you will visit. In some cases, the fact that there's a ship in port will also affect opening times. 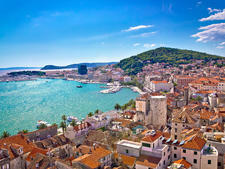 The port of Katakolon is in town, less than a 10-minute walk to the shops and restaurants. You exit the ship to an open-air dock that also has a small duty-free shop, a good place to purchase bottles of water, soda, cigarettes, alcohol and other items. 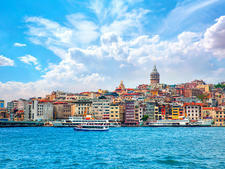 After a short walk to the right from the dock, you reach Katakolon, with its waterfront cafes and shops. The town has three streets that run parallel to the shore. The one closest to the water provides access to the marina, along with seaside cafes and tavernas. Moving away from the water, the next street is the main drag, lined with shops selling typical tourist items like T-shirts, hats, white cotton and linen dresses, and jewelry, as well as olive oil. There's also a news shop that sells international papers and an internet cafe. The third street is more residential and less touristy, but you'll find a bakery, a few shops and a traditional cafe. If you want a quick swim and you're not too picky, Plakes Beach, also known as Renata Beach, to your left as you leave the port, offers a small swath of pebbly sands. Jellyfish, however, are known to frequent these waters, so ask the locals before you jump in for a swim. Aggressive jewelers. Some jewelers hang outside urging people to come in their shops, but once you do the games begin. Expect major haggling. You may get a great deal but you also may have to work for it. Greece is hot in the summer, and its inland sites are even hotter. In the summer, temperatures can spike over 100 degrees Fahrenheit. Be sure to wear a hat and sunscreen, bring plenty of water and plan to purchase more bottled water for the ride back to Katakolon, if needed. The bus drop-off point for Ancient Olympia is different from the bus pick-up point, so listen carefully to your guide's instructions. To catch your return bus, follow the footpath to the left of the Archaeological Museum to reach the bus departure area. Allow 5 to 10 minutes to get there from the museum, depending on your walking speed. Although convenient, the cafe at the Archaeological Museum of Olympia serves high-priced soft drinks and snacks. The outdoor vendors near the entrances to ancient Olympia are often less pricey. On Foot: It's an easy walk from the dock to the heart of Katakolon with its array of restaurants, shops and the small beach. You can walk to the town beach, but the next beach is nearly 2 miles up the road. By Car: You can rent a car and drive the well-maintained roads to the ancient site yourself, picking up a guide, if available, once you arrive. Avis has a rental office near the port. With your own car, you can also visit the nearby beaches. By Scooter: Scooters (also known as motos) are available for rent in town. You'll see rental shops across from the port and along the main street. By Taxi and Van: Taxis and vans that accommodate small groups line up to meet the cruise ships. Expect a taxi to Olympia and back costs about 80 euros (about $83), with 60 to 90 minutes waiting time at the site. If you're an antiquities buff, bargain for more time. Taxis are technically required to use the meter, which includes charges for waiting time, and to give you a machine-printed receipt; however, we found that they quoted a flat rate. If that's the case, be sure to bargain -- and don't pay until after the driver returns you to the ship. The local tourism office advises against booking a taxi in advance via the internet, saying those operators will simply arrange for a local taxi and mark up the price, socking you with an added fee. By Train: At select times, a train operates between Katakolon and Olympia, and a one-way trip takes about 45 minutes. The station is about a 15-minute walk from the cruise pier. The train service operates an information kiosk at the port when ships are in town, and extra trains are added when the port is busy. Be sure to confirm train times in person; don't rely on internet information. If you can make the scheduling work, prices for the train are significantly lower than a taxi. By Bus: Private company Katakolon Express offers reasonably priced bus tours and private tours to Olympia. By Horse Carriage: Once you get to Ancient Olympia, you can walk into the site (about a quarter-mile) or take a 2-euro carriage ride to the main entrance. The euro is the official currency. For current currency conversion figures visit www.oanda.com or www.xe.com. 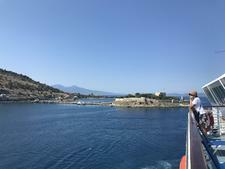 ATMs are available at the port, in the town of Katakolon (one is located at nearby Jewellery Dionisos) and also in the modern town of Olympia that borders the ancient site. Some shops and restaurants take credit cards, and a few will accept U.S. dollars. Greek is the native language, but most vendors, shop owners and taxi drivers know enough English to enable you to bargain, order food and get to and from your destinations. In Katakolon, the tavernas and cafes line the waterfront, serving traditional Greek dishes, including pastitsio (a baked casserole with ground meat, pasta tubes and bechamel sauce), moussaka (meat sauce layered with eggplant and topped with bechamel sauce), gyros (meat sliced from a vertical rotisserie and tucked into pita bread, usually with salad and sauce), souvlaki (grilled skewers of meat and vegetables), grilled meats and seafood and appetizer dips including tzatziki (yogurt with cucumber and garlic), taramasalata (made with salted and cured fish roe) and melitzanosalata (roasted eggplant, garlic, olive oil and lemon). Vegetarians will be happy to know there are usually plenty of options, including stuffed zucchini, eggplant or peppers, Greek salad (cucumbers, tomatoes, onions and feta cheese) and the dips mentioned above. You might wander along the Katakolon waterfront to choose one of the many restaurants with a view, or try one of the options listed below. Wherever you eat, be aware that "Greek time" may be more casual than you're used to, with service that is likely to be slower than back home. Ambrosia: To catch a quick bite or drink, just up the hill from the Archaeological Museum, this is a good spot -- though it's pricier than the dining options a short walk away in the town of Olympia. Stick to the gyros or other light fare. You'll be able to check on the arrival of your tour bus, since the restaurant is a stone's throw from where buses pick up returning passengers. Outside the ancient Olympic site, vendors sell souvenirs and books about Olympia. "Olympia and the Olympic Games: The Monuments Then and Now" features photographs of the sites as they appear now plus an overlay of what the sites looked like in ancient times. In town, local olive oil products, like soaps and lotions, make great gifts. For something more elaborate ArtPoint on Katakolon's main street sells jewelry, museum reproductions, mosaics and Byzantine-style icons. You might want to give traditional Greek alcohol, like ouzo (anise-flavored), masticha (liqueur flavored with resin) and tsipouro (distilled from grapes, like grappa), a try. Bartenders can also mix up riffs on traditional cocktails using the local tipples -- for example, the Mediterranean Sunset, with ouzo, orange juice and grenadine.